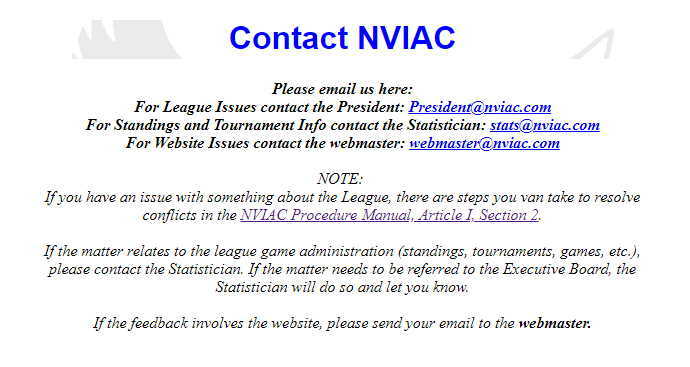 The NVIAC web site supports the activities of the league. Its primary purpose is to provide timely information to all league participants. Use the choice to return to the main NVIAC page at any time. The menu choices allow you to select either the League Standings/History or the Tournament brackets/History pages. The Member Links option provides access to the Member Sites page. The option is password protected, accessible only by the NVIAC Statistician and authorized Tournament Directors. This is the Current Standings page. It shows the current season and an upcoming season. You can access the History by clicking on the See NVIAC Standings History (all) link at the top of the table, or by choosing the Standings-History submenu under the Standings choice in the main menu. 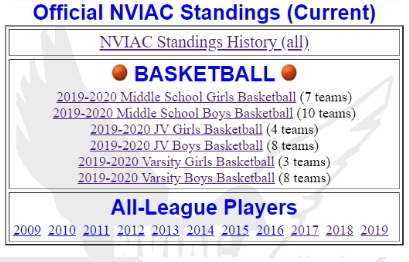 Note that you can change back to the current season by clicking on the See NVIAC Current Season link or by clicking the Standings link on the Main menu. Game Remarks: When you hover the cursor over a game, any details entered (such as the individual sets that make up a volleyball match) will be shown in a pop-up label, similar to Tool Tips. Full Sort Capabilities: The links at the top of each column allow you to sort the whole Grid by that column. Each time you click that link, the order will be reversed - Ascending to Descending to Ascending, etc. This is helpful if you want to compare teams or find the greatest Points For/Against, the highest Win/Loss ratio (to use to set the end-of-season Official Seed), the most games Won/Lost/Tied, etc. The Standings pages are designed for a computer browser, on a computer with at least 800x600 resolution. 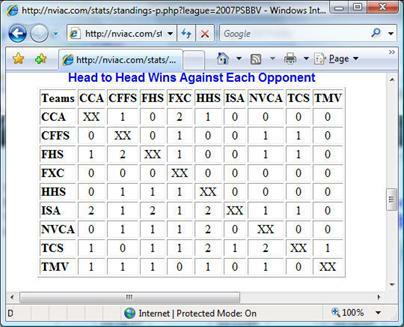 However, you can access an abbreviated Standings page by entering user the NVIAC Statistics Smart Phone http://nviac.com/sp.htm. Click on the Standings icon in the app to see a micro version of the Standings (See picture at right) Use the drop-down list at the top to choose another team. The default sort is by the Won/Loss Ratio. Click on the headings (Teams, W, L, W/L, Seed) and sort the table by that column. 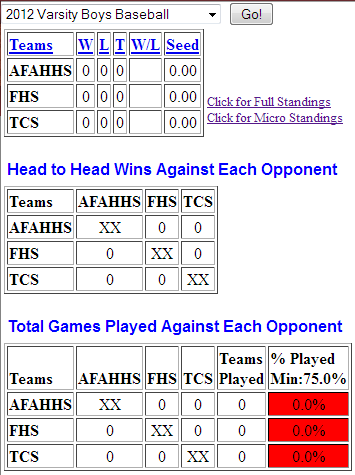 The picture on the left is the Mini version of the standings, which includes the head-to-head, total games played against opponents and all games. Click the links below or to the right to go to the other Standings layouts. If you'd like to create a PDF of the page, use the File Save As PDF option in your browser. You may then email the PDF file or print it to any printer. The PDF file is formatted as indicated in the next paragraph. Notice that the Menu and Division Selection drop-down list are removed to print only the Division Statistics, and all of the Grids (see below). These reports also include the name and contact information for the Statistician. The Head to Head Wins Against Each Opponent grid shows how many games each team has Won against their opponents. This is often used as a tie-breaker at the end of the season. While the Head to Head statistics can also be gleaned from the Standings Grid, this grid provides a much simpler summation for quick reference. The Total Games Played Against Each Opponent grid provides an assessment for each team, to ensure that every team plays the minimum number of opponents for the season. The minimum percentage is specified by the League. If a team fails to play the minimum number of teams, the % Played column shows the actual percentage highlighted in RED. The % Played value can be specified in the Site Configuration screen. The All Games Played listing shows all games that have been played for this Division. All of these games are reflected in the preceding three Grids. This is a convenient spot for Athletic Directors to ensure that all of their teams’ games have been properly reflected in the Statistics. For ease of reference, click on any of the column headings to sort by that column. Shift click an additional column to sort by the first-selected column and the second-selected column. For example, Sort the Win column to sort by teams, then Shift click on the Date column to sort by date within the groups of teams. 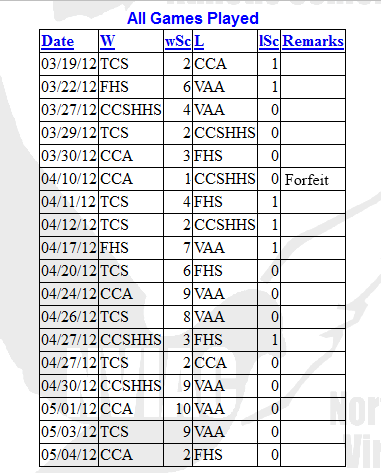 See Remarks for any game in the fourth column (such as Volleyball sets that make up the match, or Forfeit indications). This is the current season's Tournament Brackets page. It shows the current season. You can access the History by clicking on the See NVIAC Tournament History (all) link at the top of the table, or by choosing the Tourneys-History submenu under the Tournaments choice in the main menu. The calendar showing below the Standings list is the current schedule as provided to the Statistician by all of the AD's at the beginning of the season. Note that you can also open the All-League Players for each year by clicking on the year and opening the PDF. These links are also available on the History page. The previous years have been converted to PDF documents -- as shown by the light-blue document icon. The last three years, are dynamically drawn from the database -- recent All-League Player submissions will show immediately. When the year's list is complete -- all of the All-League Players have been submitted for each team in every Division -- the year will be converted to a PDF. 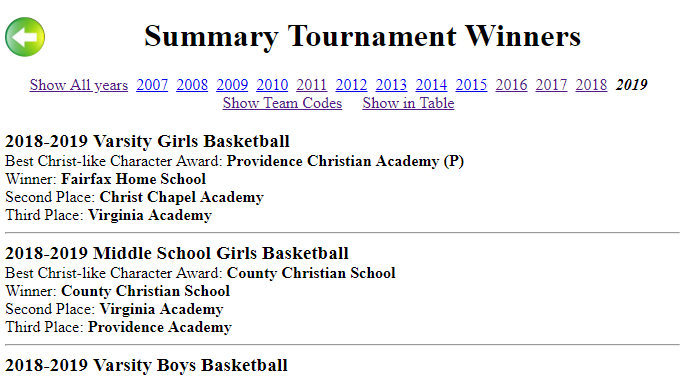 The Tournament Winners Summary link opens a summary of the Tournament Winners for each year. You can view each of the Tournament Brackets by clicking on the Division. If you want to see all the Teams that won a place in each tournament, this links shows them. You can also view all of the individual years or all of the years to date. Return to the current season Tournament Listings by clicking on the See NVIAC Current Season Tournaments link at the top of the table, or click on the Tournaments main menu listing. Note that the Tournaments that have been saved as PDF will have a PDF indicator ( ) at the end of the link. As in the Current Tournament Listings, click on the Tournament Winners Summary link to see a listing of all the winning teams for each tournament. The Tournament Bracket is published by the Tournament Director toward the end of the season. When all teams have completed their games, they will be assigned their Official Seed ranking, which will be used to place them on the Tournament Bracket. As you can see from the Tournament Bracket at the right, eight teams played the season and were ranked as shown. The typical matchup for eight teams, has Team 1 playing Team 8, Team 2 playing Team 7, Team 6 playing Team 3, and Team 5 playing Team 4. The teams will be entered in Round 1 and, as the games are played, the scores may be entered and the winning team advanced to the next round. Final winners are shown along with the Best Christ-like Character award voted by all of the teams for the team exhibiting Christ-like character in their play during the season. Each game is named (Game A, Game B, etc.). During tournament play, directions and game locations are included in the Remarks block at the bottom of the grid. For Game locations, specific game details (sites, courts, fields, times, etc.) will show in the space between the two competing teams as shown in the diagram. When the Tournament brackets are complete the bracket will be available as a printable file in PDF format. Tournament Data: Below the bracket, find the details of the tournament for this Division -- the Tournament Director assigned, the last day to play a Season game, the date when the Christ-like Character vote must be submitted, and the Tourney Start and End dates. Remarks: In the Remarks block below, find specific instructions to coaches, parents and other AD's. When the play locations are available, they will be added to the Remarks block and will then show in the Grid above, next to the respective games. Contact Us page: This opens the Contact Us page to send questions or comments to the NVIAC governing body. The warning at the top of the page, reminds potential senders that the NVIAC Constitution provides guidance in the Procedures Manual on handling disputes, and suggests they not use this Contact form to circumvent that process. Note that there are mandatory fields, marked with an asterisk. You'll not be able to send your message until all mandatory fields are entered. If your message is specific to a team or teams, please check as many teams as appropriate. The default is No team -- which is always acceptable. The Contact page is often used by spammers to distribute their messages. You much click the I'm not a robot checkbox before you can press the Submit button to send the message. FAQ page: This will contain the answers to questions often posed to the NVIAC. When you hover the mouse over a question, the Last Updated date and time appears. When you click to jump to a question, the Last Updated date and time is shown at the end of the question. Constitution page: The main page shows links to either the PDF version or the HTML version. Click on any of the Table of Contents lines and the PDF reader will jump directly to that page. Note: There are links that jump directly to the referenced sections (see the underlined words--links--in the example above). Click on the link to jump directly to the reference. There are many links that will take you back to the top of the page ([top] link shown above) to jump directly back to the top of the page. There are links in the document that will jump directly to the referenced section to make it simpler to view the related material. 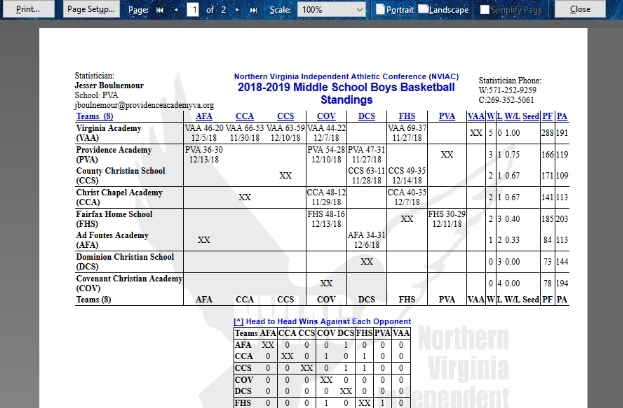 Member Links Page: This page shows all of the current NVIAC schools and provides contact information, sports play locations, where to find scores and the sports calendars and Google Maps to play locations. 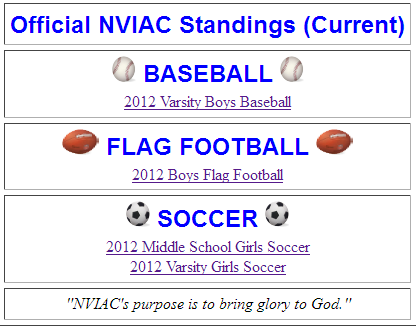 School/Team website: Click on the School/Team name to go their website. AD Info: Note that the Athletic Director is shown for each School/Team, with the emails accessible by clicking on the AD name. NVIAC Office: If the AD is on the Executive Board, the office held is shown. Play Locations: The typical locations are listed for each school. Rosters: Rosters for the current season's sports are listed under each school, as available. Click on the link to go to a map. Address: Click on the School/Team Mailing Address and a map to this address will open in a new window. Scores/Schedules: If there are sites where the School/Team keeps current scores or game schedules, there'll be a link in that column. This menu choice is only for the League Statistician or a designated representation (such as a Tournament Director). To access the League Statistics system, you will need to log in with credentials provided by the League Statistician. The Standings page, shows the current season's games only. This NVIAC for SMART PHONES page works on all smart phones.